MOTOTRBO (a.k.a. 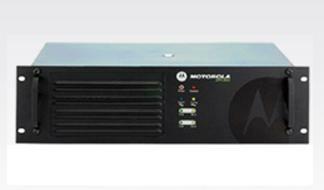 TRBO) is a Motorola Solutions branded DMR Radio. 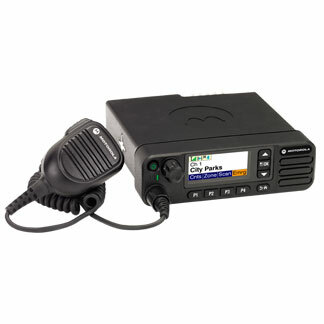 MOTOTRBO has a few more features than a standard DMR radio including IP Site Connect, which we use to network our repeaters in the USA, Germany, Australia, New Zealand, South Africa, Spain, Canada, Switzerland, Austria, Finland, Sweden, Italy, Mexico, the United Kingdom, Romania, Chile, and The Netherlands, Hong Kong, Brazil, and France. When one person transmits, multiple repeaters are keyed up on our network (like a reflector) without the user having to fumble through finding node numbers or access codes. All of our repeaters are networked 24/7. Our network is 100% DMR digital with no analog connections. Our network has some innovative features such as 2 slot communications, location finding, and text messaging capabilities. DMR, as you will read more about below, supports 2 time-slotted channels from one repeater. Many of our repeaters have time slot 1 linked to the national and international networks and use time slot 2 for local and regional communications. This means each repeater supports 2 unique voice channels at the same time! Our repeater owners and trustees constantly monitor network and repeater performance using several diagnostic tools such as RDAC and GW3-TRBO. TRBO also has an extensive 3rd party Application Developer Program. These innovators design many hardware and software accessories for the TRBO platform. DMR is an open and published international digital radio standard that specifies the 2-slot (channel) TDMA communications. 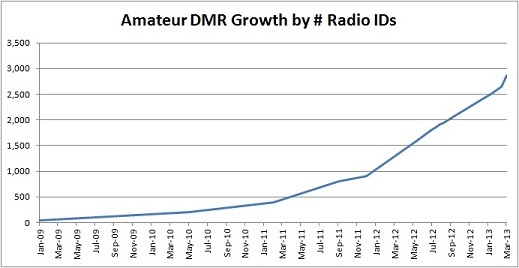 DMR is amateur radio's newest digital protocol. DMR radios are produced by several manufacturers and they all work on our TRBO system as long as they are Tier II compliant, as most are. DMR is not compatible with Icom's D-Star technology. Competition between manufacturers is a big reason why DMR radio prices are fair. DMR is here to stay since it is not a single manufacturer technology. DMR also satisifies the FCC's narrowbanding mandate by being 6.25 kHz equivalent. It's actually more spectrum efficient than other 6.25 kHz modes since no guard band is needed for the two channels. Think of DMR as 1/3 the channel bandwidth of a 25 kHz analog signal with TWICE the number of voice channels. It also offers extended battery life, and did we mention it has superior voice quality over other digital voice modes? Another advantage of most DMR radios is supurb RF performance. Many DMR radios have to satisfy both ETSI and TIA specs to perform in the most challenging RF environments. When you use a commercial radio for amateur radio you'll notice it has better intermod rejection, better selectivity, less spurious emissions, and it is mechanically a very well designed radio. Tired of the "turkey talk" and loss of signal sync from older digital technologies? Well, DMR (and in particular MOTOTRBO) has 2 layers of packet recovery: Forward Error Correction and Cyclic Redundancy Codes. DMR has better RF coverage than older digital technologies. Could there be more? Of course there is! Motorola DMR radios feature roaming. Roaming works similarly to mobile/cellular phone technology. If you program your radio properly it will find the repeater with the best signal in your local area and without your intervention, it will roam to that repeater. Lately, distracted driving and safety have become very important issues. MOTOTRBO DMR allows you to focus your attention on driving and not on changing repeater channels. Roaming is used extensively in Northern California, New England, and Chicagoland. How many DMR repeaters and users are there? There are many choices. Some radios have less functionality and are less expensive. Do some research on what radio is right for you. Make sure you purchase a 403-470 MHz radio NOT a 450-512 MHz UHF radio! You may use this link as a crib sheet to make sure you get the right radio when ordering. 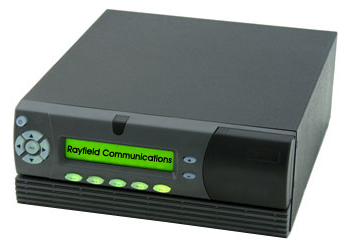 Our network is connected to several networks of repeaters via Rayfield Communications' C-Bridge. So, on our network you have access to nearly 185 repeaters simultaneously when you key up on the networked time slot! In the Summer of 2013 we also introduced a new Spanish language worldwide talkgroup. Contact us if you would like to join. I'd like to present this to my club. Can you help? Sure! Download the brief presentation we used at Dayton and convince your club that a TRBO repeater will move them into the 21st century of digital communications! Then apply to join our worldwide network. "MotoTRBO outperforms similar FM coverage, sounds excellent by far over the other digital modes and full duplexes incredibly well. Networking the repeaters is simple, very close to plug n play. While costs are higher than ham-only radios that we are all generally using, the used radio market is not overly expensive considering you will have a narrow-band capable analog and digital radio useful for GMRS, commercial, public service, MURS, Itinerant, etc. TRBO simply brings more enjoyment to hamming and more life to repeaters that seems to have diminished on the FM repeaters in recent years." "MotoTRBO on the amateur band has made amateur radio exciting for me again! After barely being a part of the hobby for the better part of 10 years, this new media has engulfed me!" "I was introduced to MotoTrbo at Field Day 2011 by Jeff, KØJSC, and was instantly hooked! A week later I had my first HT and had it programmed by Reid, NØRC, in time for a vacation trip to the east coast where I met additional Trbo users and enjoyed being ”walk-about” in Washington, D.C. and making contacts worldwide! I now have an XPR-4550 (mobile), an XPR-4300 (base), the XPR-6500 (HT), and am working quickly to put the first VHF MotoTrbo repeater on the air in Kansas City along with a UHF machine east of the city! 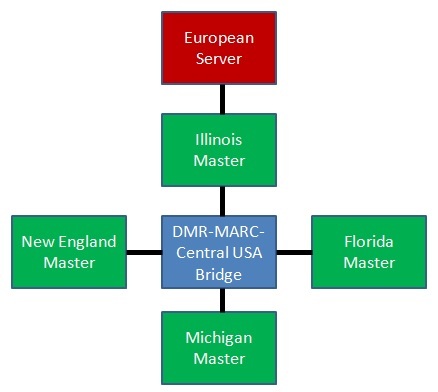 The DMR-MARC network and community of users has been incredibly helpful and welcoming! Now I’m getting started as one of the NCS operators on the Saturday DMR-MARC Worldwide Net. 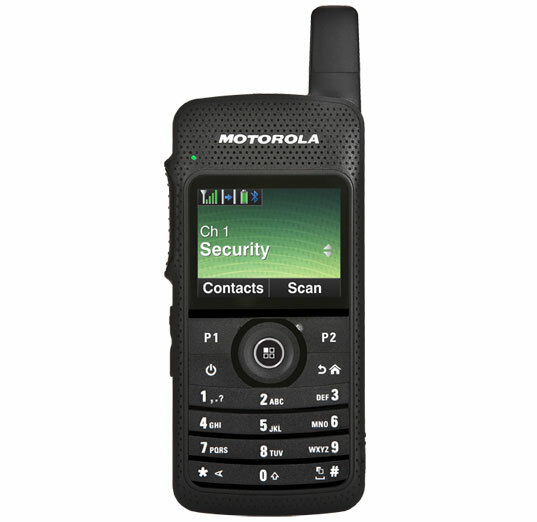 MotoTrbo and DMR-MARC are WHERE IT’S AT! GET ON BOARD!!!" 1. Can I use the MOTOTRBO Anywhere app on DMR-MARC? No. The app requires a $50,000 hardware gateway which we do not have. 2. Do I have to buy a DMR radio to use the network. 3. Do I need a C-bridge to join the network? No. Just apply to join the network and we will find a suitable master repeater for your peer repeater. 4. Do I need to make a voice ID on the network or is a numeric ID legal? According to USA FCC rules, one must identify with voice every 10 minutes and at the end of the call. Other countries may have more lenient requirements. The GSM ID on your radio is nonetheless, not a legal ID. 5. Who is my local Motorola dealer? Do they offer "ham friendly" pricing? 6. Are used radios available? 7. Will my non-Motorola DMR radio work on the network? For voice calls, yes, for roaming and texting maybe not. Some alternative brand radios are Vertex Standard, Tait, Kenwood, RCA, Connect Systems, Hytera, Harris, Kirisun, Simoco, Sepura, and BFDX. As long as the radio is DMR Tier II complaint, it'll work on our network. 8. Should I disable AGC on the network? The majority of users should. Check the Audio Calibration link to learn more. There have been some criticisms of DMR audio but most of it is due to people who do not disable AGC. 9. Can I make up my own talkgroups for use just between friends? No. Only use the lakgroups listed on the Google Map on the Networked Repeater Page. You will end up confusing other users and using an unpublished talkgroup which is against the network rules, and possibly against federal regulations. 10. Can I use a Hytera or Vertex repeater on the network? Vertex, no. A Hytera repeater now functions on the DMR-Plus side of the network. You will have access to over a dozen DMR-MARC talkgroups on time slot 1 (DMR-MARC Lite) and several DMR Plus Reflectors on time slot 2. This is the best of both worlds. 11. Can I have this DMR-MARC Lite on TS1 and DMRPlus on TS2 on a Motorola repeater? You sure can! While you won't get all of the DMR-MARC tallkgroups like TG1-14 you will get many opoular ones and will have access to many more reflectors. It's your choice. Choose DMR-MARC Traditional with all talkgroups or DMR-MARC Lite to mimic the Hytera option. 12. Can I connect IRLP, Echolink, Allstar, D-Star, or an analog bridge to the network? 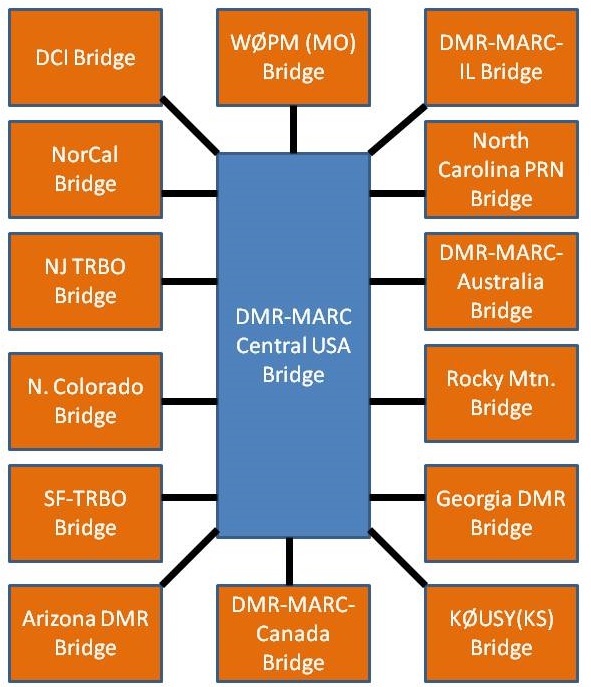 You may not connect these to any DMR-MARC talkgroups including North America, Worldwide, Europe, Latin America, any of the worldwide language talkgroups, or any regional USA talkgroup. 13. Can I loan one of my radios to a friend with my ID so he/she can try DMR? 14. Why should I invest in DMR over other digital alternatives? Best RF Performance; Battery life; Number of Different Manufacturers; 2 voice channels from one repeater offer local, regional, national, and international talkgroups; and Great audio quality. 15. Where is my nearest DMR repeater? Check the Google map on Networked Repeaters link at the top of this page. 16. I live in an area without a local affiliated repeater. Is there a dongle interface to DMR-MARC? No. You or your club will need to get a repeater to interface to this radio network. All stations using our network must have a valid amateur radio license. Choose a country below to find out how to get the license. It's easy and inexpensive! You may not make any private calls on any DMR-MARC networked slot. However, text messages are OK on a networked slot. Remember to DISABLE ARS on on any DMR-MARC networked time slot.